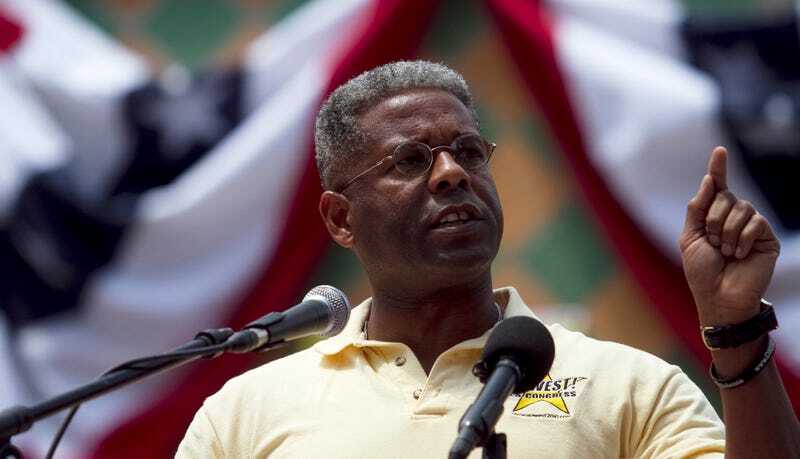 In 2012, incumbent Florida Congressman Allen West was unseated by slightly more than 2,000 votes in the most expensive congressional race in history to date. Since then, he’s somehow managed to find the time to write a book called Guardian of the Republic, appear frequently on Fox News, and now—thank bearded Christian God—write a blog post about how the government has got to keep its hands of his meat. West, a climate change denier, also denies that meat is anything but a delicious and consequence-free indulgence. This past Saturday the grill menu was steak, bratwurst, Italian sausages, and to honor my Texas Longhorn guests, Earl Campbell sausages — damn good eatin’ folks. And yes, just to show my wide range of skills, I did Caribbean jerk chicken. And now, thanks to the World Health Organization, my friends could sue me. Shortly after claiming that serving meat can get you sued by your friends, West bemoaned the “fear mongering” and “intimidation” of the World Health Organization (“In all seriousness, what is up with the WHO?”) and claimed that nothing will get between him and his processed animal carcass—nothing. Not the lib’ruls, not the communists, not scientists, and especially, especially, especially not Michelle Obama. Sure seems this study is all about some liberal progressive agenda. What happens if all of a sudden government takes this study as justification to regulate what we eat — man, can you imagine First Lady Michelle Obama coming up with the football tailgate menu? Our kids hate the new school lunch menu — so what’s next? Or will grocery stores be “fined” for selling meats deemed to be carcinogenic? Will the FDA all of a sudden demand all specified meats on the WHO list have certain labeling like cigarettes? Oh, here comes the big one, will there be increased taxes on these meats in order to deter their purchase? After all, big government would be doing it to save and protect us from ourselves. Laugh as you may, but think about the sugary drinks tax idea of former Mayor Michael Bloomberg. From my sticky, sauce-covered hands!